In Memory of Bill Taggart, Lion Founder and C.E.O. We are saddened to announce that Bill Taggart, founder and C.E.O. of Lion Technology Inc., passed away peacefully on January 4. 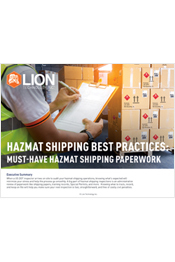 Kick off 2019 with a fully engaged hazmat training experience to update your shipping expertise for 2019—or train someone new. Starting tonight at 12:00 midnight, US EPA will suspend its support for the new electronic Manifest (e-Manifest) system and the RCRAinfo portal used by hazardous waste generators, transporters, and treatment, storage, and disposal facilities (TSDFs) due to the Federal government shutdown. This time, the bill is $7.4 million. US EPA published its Interim final rule Safe Management of Recalled Airbagsto the Federal Register on Friday, November 30. This minor adjustment occurs once per year—but with penalties assessed on a per day, per violation basis, even small increases to penalties can quickly add up.